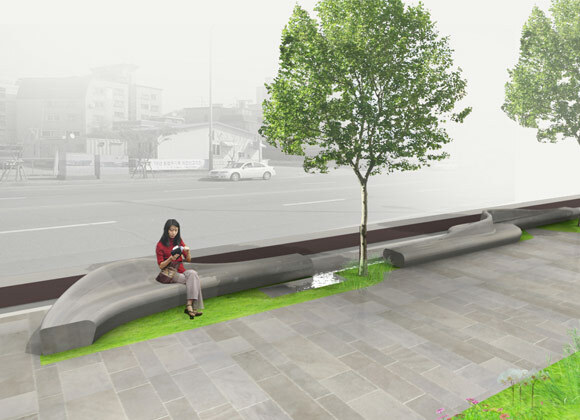 Commissioned by the local council, Lokaldesign developed a range of street furniture prototypes and the public space strategy for a part of the Digital Media City in western Seoul. Our approach was to integrate water features, seating and planting seamlessly. The built environment of the Digital Media City stores uncomfortable amounts of heat in summer. We proposed a neighbourhood-wide strategy to counter the Heat Island Effect, using harvested rainwater in little streams, channels, water walls and fountains. The redesign of the cycle path, sheltered meeting spaces and the connection to the public space network of the local river aims to further encourage the use of the spaces throughout the year. Simple and durable natural materials ensure the long-term viability of the streetscape.